There has been a drumbeat of headlines and an outpouring of congressional criticism about the widespread technical problems plaguing the online health insurance exchanges where consumers were supposed to be able to explore, compare and buy coverage. The contractors who built the online marketplace were grilled last week before the House Energy and Commerce Committee, and today, Health and Human Services Secretary Kathleen Sebelius is scheduled to sit in the hot seat. 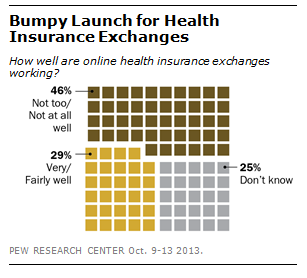 A Pew Research Center survey conducted Oct. 9-13, shortly after the Oct. 1 launch of the exchanges, found a broad impression among the public that they were not working. A plurality (46%) said they were working not too well or at all; just 29% said they were working very (7%) or fairly (22%) well. A plurality of Democrats (44%) said the exchanges were working well, compared with just 25% of independents and only 14% of Republicans. Assessments were somewhat more positive in states with state-based health care exchanges (32% say exchanges are working well) than in those where these exchanges were being run by the federal government (26% say working well). There were 27 states that decided not to create their own exchanges, defaulting to a federal exchange. Of the remaining 24 (including Washington, DC), 17 are creating state-based exchanges, while 7 are creating state-federal partnership exchanges. About six-in-ten uninsured Americans live in states that haven’t set up their own health-insurance exchanges under the Affordable Care Act.